Compel Voices Against Injustice to celebrate today's champions of human rights by presenting the annual Salem Awards, stewarding the Salem Witch Trials Memorial, and inspiring members of our worldwide community to confront fear and social injustice with courage. The lessons from the Salem Witch Trials compel Voices Against Injustice to celebrate today's champions of human rights by presenting the annual Salem Awards, stewarding the Salem Witch Trials Memorial, and inspiring members of our worldwide community to confront fear and social injustice with courage. • Supporting the Salem Witch Trial Memorial, a public monument and place of reflection honoring those who died in 1692. • Publicly recognizing individuals or organizations working to help those who suffer discrimination and injustice. • Offering educational programming and content that broadens awareness of human rights and social justice issues. Publicly recognizing individuals or organizations working to help those who suffer discrimination and injustice; Supporting the Salem Witch Trial Memorial, a public monument honoring those who died in 1692; and offering educational programming that broadens the community’s awareness and understanding of current issues of human rights and social justice. Voices Against Injustice provides educators and communities with content and suggestions on how to use the lessons from the Salem Witch Trials to educate and inspire people to confront social injustice with courage. The Salem Witch Trials Memorial honors those who unjustly lost their lives in 1692. 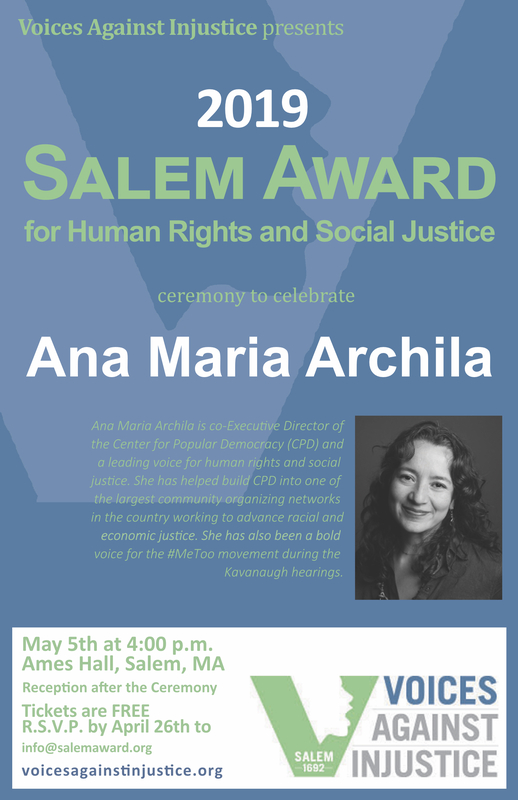 The annual Salem Award for Human Rights and Social Justice recognizes and celebrates individuals and organizations who are helping to raise voices and to confront fear and social injustice with courage. The Salem Award was established in 1992, the tercentenary of the Salem Witch Trials. We invite you to get involved in supporting the work of Voices Against Injustice. You can help us in several ways. Donate. Financial contributions are always welcome. Volunteer. The gift of your time will help us advance our mission. Spread the Word. Help us amplify the lessons from the Witch Trials and inspire others to confront social injustice. WHY DONATE TO VOICES AGAINST INJUSTICE? Because gifts like yours have made it possible for us to maintain and protect the Salem Witch Trials Memorial. We invite you to follow and support the work of Voices Against Injustice. There are a number of ways to be involved! Although financial donations are always appreciated, the gift of your time is extremely valuable to us as well. In addition, educating yourself about contemporary issues of human rights abuse and social injustice is another way to support the mission of the VAI. WHY DONATE TO VOICES OF INJUSTICE?